Wabirds, especially giant scale fighters, are very popular these days. Go to any warbird event and you will see at least these three classic fighters, the P-40 Warhawk, the P-51D Mustang and the F4U Corsair. 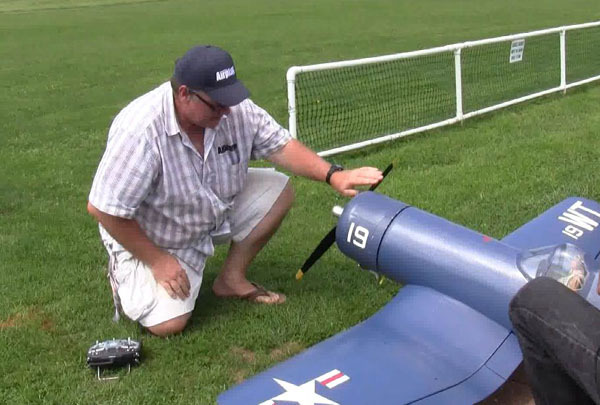 With so many great flying warbirds, more RC modelers are stepping up to the giant scale class and enjoying the power and performance of these WW II classic dogfighting machines. 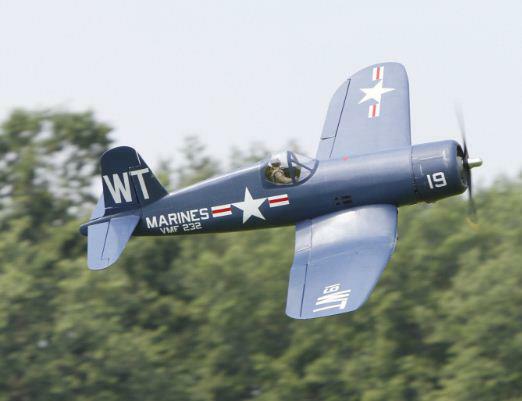 One of my favorite giant scale warbirds is the F4U Corsair ARF from Top Flite. Compared to other warbirds in its size range (50cc engine, 86.5 inch span), the big bent-wing warbird is a relatively easy to fly model. But if you have never flown a big, giant scale warbird before, it does take a little getting used to, before you can become comfortable flying in the traffic pattern. Here are some tips for flying your first Giant Scale Warbird. Ground Check All successful flights start with a proper preflight condition check. Actually, this is a good thing to do for any size RC plane, but I consider it mandatory for big warbirds like the Corsair. But even before you get to the flying field, be sure everything is assembled correctly and that you have added some lock-tite to all the nuts and bolts you don’t want coming loose. Also, be 100% sure that your model is properly balanced and the CG is where it is suppose to be. 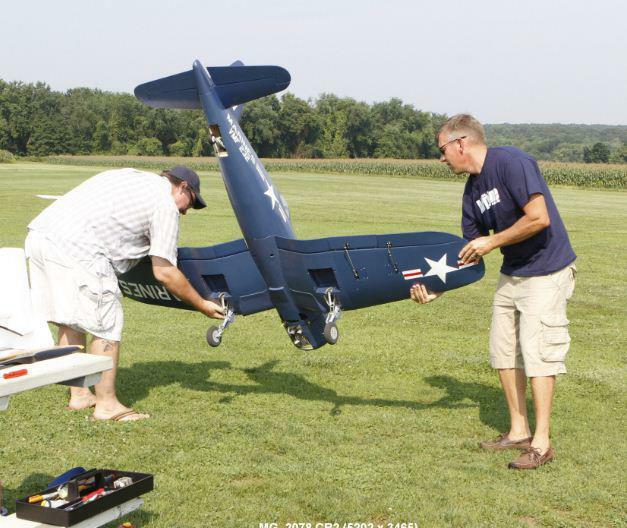 A good bit of advice here is to team up with an experienced RC warbird pilot before and during the first flight. Two sets of eyes will help discover any issues that may need correcting. Also, having a pro test fly your plane first is the best way to start off. Controls. The first thing you should do is perform a radio/control check. Don’t just wiggle the sticks and see that everything moves. Make sure everything is moving in the correct direction. Stand at the tail of the plane looking forward and pull back on the stick. The elevator should move up. Check the ailerons in the same way. Move the stick to the left and the left ailerons should move up while the right one moves down. Be sure to check the rudder in the same way, as well as the throttle. Push the stick and make sure the carburetor opens up. Make sure all the controls move freely and do not bind. With flaps sometimes they can reach the end of their travel and cause the linkage to hit the servo hatch cover. Use the end point / servo travel function of your radio to set up the flaps so they do not cause the servos to bottom out in either the up or max down positions. You can hear the servos buzzing if they do. This can drain your battery pack so take care of this in the workshop. For your first warbird I recommend using the control throws listed in the instruction manual. This to work every time and you can adjust the throws to your liking after your first flew flights. With the Top Flite Corsair I was surprised with how little elevator throw was called for. Only 3/4-inch up and down for the high rates, and 1/2-inch for low rates. As it turned out, this was just about perfect while using 20 percent Expo. You don’t want an overly sensitive airplane on the first flight, especially in pitch. Firewall Forward. Fuel up your model and then start your engine to check its performance. Gasoline engines are easy to operate if you use the correct procedure to start them. But also you have to install the engine, the fuel lines and tank properly. Use gasoline grade lines and tank stopper and install a fuel filter between the tank and the carburetor. It is a good idea to install a filter in your fuel supply container’s filler line as well. Be sure to use the correct size propeller as recommended in the engine manual. Start the engine and let it warm up for a minute or two. Have a friend secure the model’s tail and then advance the throttle slowly to full power. You should have a smooth transition from idle to full. Adjust the carburetor as needed so the engine doesn’t load up after a sustained idle. Also, adjust the high end needle for max power and then back off the needle slightly for a 200 to 300 rpm drop. Do not run your engine lean! With the engine running do a radio range check. If everything checks out, you’re ready for your first flight. Cycle the gear once or twice with the engine running and make the retracts’ air system maintains proper pressure. Takeoff Big warbirds with big engines have lots of torque on tap so advance the throttle slowly and smoothly. Don’t just jam it full on! Rudder is you friend here so anticipate a slight drift to the left caused by the torque. Fed in a small amount of right rudder and hold it in until the model gets back on course. It may also be helpful to hold some right rudder during the climb out. Don’t horse the plane off the ground. Get in the habit of using all the runway available until you get to know the plane. 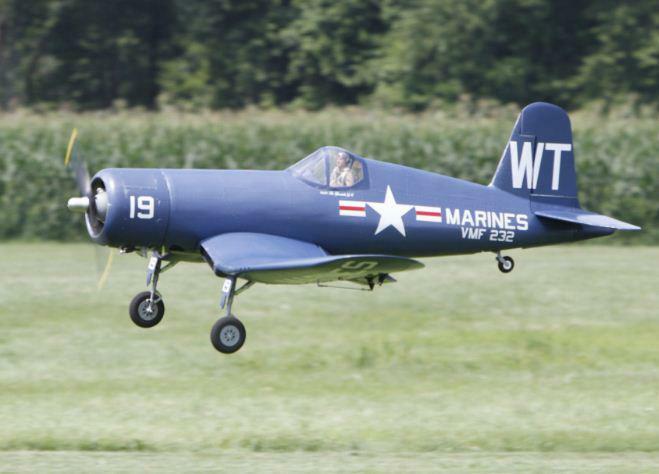 With the Corsair and its rearward moving retracts, the model is a bit nose heavy with the gear down and so, does not like to hop off the ground without a bit of back pressure on the stick. This is a good thing. After a decent ground roll, slowly pull back on elevator until the model breaks ground. Hold the back pressure and see how the model climbs out. If it starts to steepen ease off a little on the back pressure. After establishing your departure, think about hitting the retract switch and pulling up the gear. Make a climbing crosswind turn (away from the pits and flightline) and head downwind while maintaining a shallow climb. If this is your first giant model, keep in mind that it is going to look bigger in the pattern than your standard size sport plane. You start flying the plane too far out if you maintain your old sight window for a perceived model size. Make a 180 degree turn back to upwind and start trimming the model for straight and level. I like to do this at cruise speed which is about 2/3 throttle depending on your model. Don’t fly your entire flight at full power! Fly a few more laps around the pattern and feel things out. First landing After a little while, you may want to bring the model in for a landing and calm down a bit. Have your instructor bring it in for landing and have him call out what he’s doing. Where he reduces power and lowers the flaps and retracts, what power setting he’s using on final and so on. Once safely on the ground, you can go over the trim settings and check the plane’s condition for anything that might have come loose. Grab a soda and discuss the plane and its performance. Check the radio’s battery pack voltage, and top off the air pressure for the landing gear. Refuel the plane and make another flight. Go through the whole sequence again and concentrate on flying smoothly. Don’t get tunnel vision or freeze on the sticks. Try to relax and talk with your instructor during the entire flight. You know the plane flies great! Now perform a few maneuvers at a safe altitude. Try a loop and then a roll or two. Perform both maneuvers into the wind. Now slow things down a bit and fly a few laps at reduced airspeed. Fly at reduced power and then make a lap or two with the flaps down a notch. Note whether the nose rises or tucks down when you lower the flaps. Note the amount of trim (if any) that’s required when you reconfigure your plane. Stall Test Next see how your model reacts during a stall. This helps you recognize when the model is approaching its minimum airspeed condition and how to recover quickly. If you’ve balanced your plane properly, it should not snap violently when the wing stalls. Climb to a safe altitude, slowly reduce power and keep the wings level. Start feeding in up elevator to maintain altitude while reducing power. If the wings start to rock, use rudder to correct. When the nose drops, release back pressure on the stick and smoothly apply power. If the stall produces an extreme nose drop, release the back pressure and establish forward (downward) flight to increase airspeed while applying power. Then apply some up elevator to return to straight and level. Once you know how the plane behaves in a stalled condition it will make your landings safer and more precise. Now fly a few more laps around the pattern, and setup for your first landing. Landing pattern The best way to perform consistent landings is to set up the approach the same way every time and let the process before automatic while developing good habits. With the increased drag produced by the flaps your warbird will start to slow down When your reduce power during the approach your model will continue to lose airspeed and you will need to adjust your power setting to control your descent rate. Remember, throttle controls the rate of descent and elevator controls airspeed. I like to make a traffic pattern pass directly in front of myself then bring power back to half and lower the landing gear. You should visually confirm that your wheels are all the way down before committing to land. About 100 to 150 feet is a good pattern altitude. Turn to the downwind leg and feed in half flaps. You can set up your radio with a slider switch or with a three way switch for up, half and full down flap positions. I use a slider that has an audible tone for half flaps. 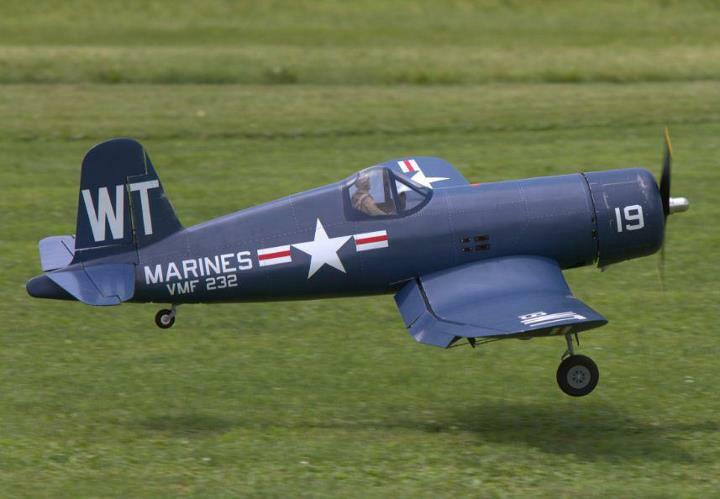 With the Corsair no retrim is required when the flaps are lowered but if your model needs it, make any required corrections to maintain a slight nose-down attitude. With some radios you can mix in some elevator correction when the flaps are deployed. Flight testing helps determine how much is needed. Make your turn onto the base leg at about 100 feet and add the last bit of flaps. Turn on to the final approach and establish your descent by reducing power to a little above 1/4 throttle. Keep the nose pointed down slightly and maintain level wings. Adjust the throttle slightly to maintain a smooth landing approach and concentrate on bringing the plane to the end of the runway at about 10 to 15 feet above the ground. If you’re coming in too steep, add some power. If the model is too high, don’t dive for the deck. Apply power smoothly and try again. Go around at about with increased power and set up a new landing approach. But don’t attempt a turn until you have gained sufficient airspeed. Use rudder to keep the plane on course all the way to touchdown and use small aileron inputs to keep the wings level. Most experienced warbird pilots shoot their landing approaches at a 30 to 45 degree approach angle. This helps maintain proper airspeed and control. Don’t try to drag your plane in at a normal, flat landing approach. Too often this leads to the airplane slowing down too much and entering a tip stall. Touchdown. When the plane is at the end of the runway reduce power to just above idle and start pulling back on the stick for the landing flair. Don’t force the tail down with excessive up elevator. Let the plane settle onto its mains and stay on the rudder to keep the plane on the centerline. Once the plane is on the ground reduce power to idle and let the tail come down by itself. If you force the tail down during the flair, you can cause the plane to liftoff again which would be bad, as the airspeed is now very low. Again, being smooth on the controls is the key. Once the plane back on the ground and stopped you can relax a bit and then taxi your mighty warbird to the pits to clear the runway. It’s no secret that to become a good pilot you need to practice. Concentrate on learning one task at a time and doing it well before going on to the next. The same applies with giant warbirds. Hook up with an experienced flying buddy and fly, fly, fly. Nothing feels as great as mastering a giant scale warbird. Soon you’ll be the pro that helps other new warbird pilots earn their solo wings! Good luck, have fun and don’t forget to check your six! Fantastic Gerry! Just last week I was teaching a guy in Brasilia how to land his warbird. I told him exactly what you said. Engine for descent rate and elevator for airspeed! His first landings were a sequence of boings. After my advice, he started making smooth landings with his A-10 ! I love warbirds! all very good information.. Even a experienced pilot should read this occasionally. A common mistake that I have made and seen others do the same is when flying a Scale plane we need to remember that these birds don’t fly like a sport plane that will make that last corner with the idle down. Leave that throttle up Till right over the runway or the bigger/heavier planes will stall before you know it! Thanks for the article.